Social content is increasingly being used by people to find information and purchase products. Search engines have embraced this trend and are displaying more social content and profiles into it’s results pages and the Knowledge Graph. In this post, I’m going to show you examples of indexed social content from Pinterest, Twitter, YouTube, Google+, SlideShare, and Facebook and what you can be doing to optimize and increase visibility for your social content and profiles in Google Search. At the time of writing this post, a search in Google (site:www.pinterest.com) returned about 166,000,000 Pinterest results (this number can and will vary depending on when and where you are searching from in the world). It’s important to note that many of these results are most likely buried deep in Google’s search results pages, so to gain a better understanding of the total opportunity, I turned to the competitive research and analysis tool SEMrush to help me understand how many results were being returned on the first two pages (most likely to get clicks from a Google searcher). The tool returned 5,510,977 Pinterest content surfacing on the first two pages of Google results which included a healthy mix of pages, pins and boards. Tweets and Twitter profiles are no strangers to Google Search and are likely to become even more prominent with the recent agreement between Twitter and Google. At the time of writing this post, Josh had 580 tweets indexed in Google Search. He’s tweeted 10,400 times which gives him an indexation rate of 5.6%. How many tweets are getting indexed in Google Search? In a recent study by Eric Enge and the Stone Temple Consulting team, they analyzed 133K+ tweets, and found that around 7% were indexed in Google Search. Eric’s study also uncovered a correlation with profiles that have a higher follower count and the indexation rate of tweets for these users. While it’s not known if Google is exclusively using the number of followers, it’s likely they’re using a combination of metrics to evaluate which tweets to index and from which users. It’s important to clarify that you don’t need to be following a user for their tweets to appear in your results. Indexed tweets that surface in Google Search seem to be more based on relevance and authority than personalization. It’s possible that once Google starts crawling and indexing tweets in real time, searchers will notice an uptick of tweets appearing in search results. This additional visibility represents an exciting opportunity for active users to build their following and make their Twitter accounts destinations. Did you know that Google+ posts, pages and communities all get crawled by Googlebot and can appear both inside and outside of personalized search? A personalized search occurs anytime a user performs a logged-in search from any Google property including Gmail, YouTube, Google Play, Google Analytics, etc. Google uses your search history in conjunction with your connections to display results if feels are relevant to your search. Personalized search represents an incredible opportunity for users to bypass many of Google’s traditional ranking factors and instead become visible based on an element of social trust. Other Google+ users that have you in a circle and engage with your posts may be served results that include posts you’ve shared that Google feels are relevant to the user’s search. Both Jason Darrell and Ryan Hanley are in my circles and users that I engage with frequently on Google+. You’ll notice the Wikipedia result is appearing below both Ryan and Jason’s posts which showcases how personalization and search history lead to social content that’s often ranking higher than authoritative, trusted websites in Google Search. Before the Google Authorship program was discontinued, the Google Authorship and Author Rank community on Google+ had become a destination for users to discuss, share, and learn more about utilizing Google Authorship. Because the community was actively moderated, it provided a great user experience and as as result earned many links. This combined with other factors has made the community visible outside of personalized search. This community isn’t alone in that other large, active, communities on Google+ are surfacing for relevant queries outside of personalized search. SlideShare is the world’s largest community for sharing presentations and presents marketers and businesses alike with an opportunity to get discovered in Google Search. 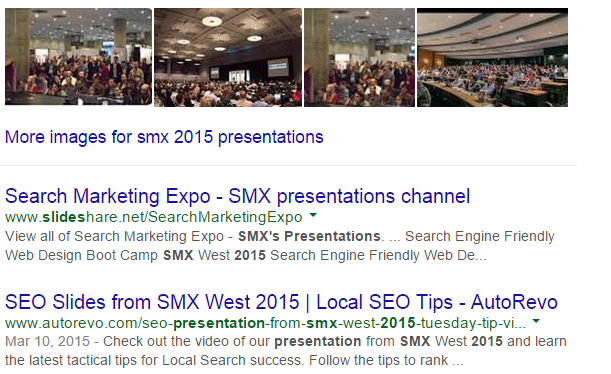 How many SlideShare presentations are indexed? In performing an site search for SlideShare presentations and profiles in Google, it appears there are around 77,900,000 results indexed. I again used SEMrush to evaluate how many results were ranking on the first two pages which returned 362,099 results. Using SlideShare to repurpose your content is a great way to reach new audiences and potentially increase your visibility in Google’s search results. Videos are a powerful content format that can be utilized to help you attract and convert new leads. Hosting your video content on YouTube presents users with unique benefits in Google Search. YouTube is the world’s second largest search engine and has an estimated 1 billions users with 4 billions video views per day. If that wasn’t enough, YouTube videos frequently surface in Google’s Web and Videos search and receive a “rich snippet” next to video results which makes videos standout from other search results. Similar to webpages, YouTube videos can amass authority which can lead to increased exposure for your YouTube video content in both Google Web, Videos, and YouTube search. Aligning the title, description and tags with relevant keywords and phrases that searchers are actively using can work to increase the chances your video content will appear for related searches. The autocomplete tool Soovle.com provides search suggestions from some of the major providers on the web including YouTube! 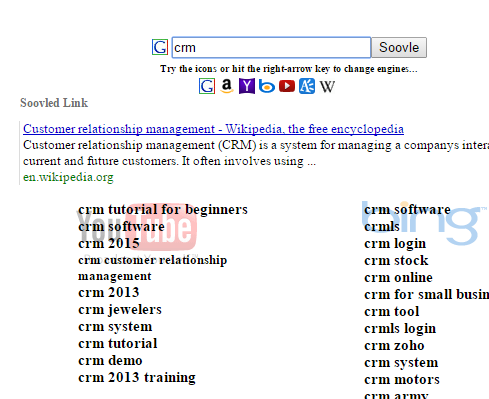 Here’s a screenshot showing results for the query “CRM” in Soovle. Facebook pages and posts are crawled by Google. 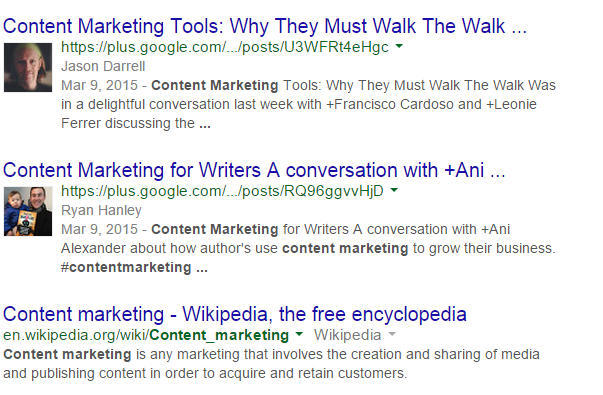 While pages seem to surface much more frequently, posts can and do get indexed. I performed a site search for HubSpot’s Facebook page which returned 3,630 results. Here’s a screenshot showing indexed Facebook posts in search results. Google will look closely at your page’s name and web address to help it understand what entities (people, places and things) your page might be relevant for. If you are setting-up a business page, these will both most likely be your business name. In January of 2015, Google announced support for markup that specifies social profile information in Knowledge Panel results for some searchers. While the move primarily affects public figures and larger corporate brands that receive a Knowledge Panel result for branded searches, the move signfies a continued effort by Google to incorporate social in to search. 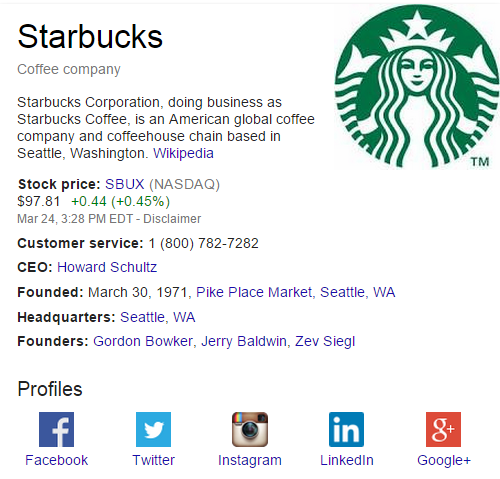 Here’s a screenshot of Starbucks Knowledge Panel that includes links to its verified social profiles. Social profiles and content are becoming an increasingly prominent touch point on the path to purchase for many industries and can be a customer’s first experience with a business or brand. Your social profiles and the content you publish can be optimized and transformed into effective marketing tools that can be utilized to create experiences that lead to both awareness and advocacy. While I’ve advocated using keyword to optimize your social content, they should always be used in a way that’s natural and provides value to the user. You’ll also notice that I’ve listed engagement as a way to increase the visibility of your social content both on social platform and Google Search. Connecting and building relationships with other users is a great way help amplify your the content you publish across social platforms and increase the chances that it will get shared, liked and engaged with. How has social search impacted your online presence? Brian Jensen is the Owner & CEO of Congruent Digital, a boutique online marketing agency that provides clients with a customized, audience-first approach to digital marketing. Connect with him on Twitter, and Google+.